You don’t need us to tell you how stressful parenting can be. After all, there’s so much to do and remember – how do you fit it all in your brain? That’s where well-designed, thoughtful and genuinely useful baby apps can lend a hand. Baby apps, such as those that help you log and monitor baby’s feeding and sleep habits, or baby sleep music apps to soothe a restless babe, are meant to empower you along your parenting journey. That's why we’ve selected some of the best and most popular baby apps you can download today. We've chosen them based on their features, build quality, user reviews and ability to support you in your role as a parent. Some of the apps have free or 'lite' versions to start with, before offering in-app upgrades or subscriptions for ‘full-fat’ versions, while others are completely free. 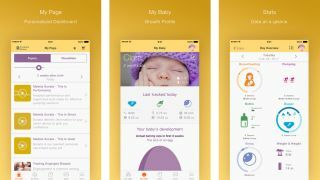 If you want an all-singing, all-dancing baby tracking app, Baby Connect is for you. It acts as a full activity log, enabling you to record baby’s breastfeeding, bottle-feeding and eating patterns; baby’s naps, mood, body temperature, likes and dislikes, and the big milestones (first tooth, first step, and so on). You can also upload photos and keep notes in-app. If baby stays with a caregiver when you’re at work, you can add the caregiver's profile to Baby Connect so that they can also input data, keeping you all in the picture regarding baby’s wellness. There are some serious-looking graphs to explore, with previous day and week averages available for comparison so that you can track baby’s weight, height and head size development. If you want an app that dispenses doctor-approved medical advice in a flash, try WebMD Baby. Another highly-rated, feature-packed baby app, WebMD Baby has been downloaded over 1.7 million times and has an extensive library of medically-approved content, including 400 articles, 598 tips and 70 videos. There’s 16 categories alone for Baby and Toddler Care, with other categories including Illness and Emergencies, Vaccines, Baby Doctor Visits and Ask the Pediatrician (eight video Q&A sessions with a WebMD in-house pediatrician). There are five baby tracking features to take advantage of: Sleep Tracker, Diaper Tracker, Growth Tracker, Feeding Tracker and Baby Book (a place to capture memories of your baby). The all-in-one baby tracking apps listed above are great for a general approach to food tracking and logging, but you'll need a niche app if you want to really drill down and get specific. Baby Weaning and Recipes is perfect for parents looking to wean their babies. The app has been developed by leading parenting website MadeForMums, in association with SMA Nutrition. There's 193 daily baby food recipes and meal planners, including first purees, scrumptious finger foods, and meat, fish and vegetarian meals, not to mention breakfast dishes, puddings and healthy snacks. There’s also a shopping list function, plus a guide to portion sizes and whether any of these homemade dishes can be frozen. When you sign-up to the Baby Weaning and Recipes app you’ll also be registered to the SMA Baby Club, which entitles you to a free welcome pack. Keep your little one entertained during meals out with this free baby game app. Sensory Baby Toddler Learning is designed to visually stimulate your child and, through a series of simple taps and touches, boost their fine motor skills. Choose between a selection of backgrounds and scenes (coral reef, shipwreck, and so on) and which fish or sea creatures baby would like to play with - there are even seahorses and turtles! Once you have set-up the game scene, baby can have fun dabbing and touching your phone’s screen to interact with the colourful fish and creatures. The screen in turn will vibrate at every touch. The moving fish, coupled with the sound effects and vibrations, should keep baby entertained long enough for you to finish your lunch. Soothing baby to help him or her fall asleep can take a serious amount of effort, not to mention a good bedtime routine. Give yourself a helping hand with the Lullaby For Babies app, designed to calm your little one with a peaceful lullaby that, combined with lovely snuggles with you, helps settle them for sleep. There are a range of lullabies to choose from and you can schedule when and how long they play for each night. Lullaby For Babies is for Android users only, though, so if you’re an iPhone or iPad user you might like to try Lullabies and Teddies, which has 21 lullabies and a range of plush animals for baby to coo at on-screen. Baby sign language is used to help babies and toddlers communicate their emotions, desires and to identify objects before they begin speaking. If you want to teach your baby sign language with the help of an app, Baby Sign and Learn is one of the best available right now. It includes a series of animated video demos to capture the attention of your little one, and has 300 baby signs for your little one to learn. However, the number of baby signs relevant to your little one depends on where you live. Baby Sign and Learn is more geared towards the American Sign Language (ASL) but there are a number of British Sign Language (BSL) signs in the app, as well as Auslan (Australian Sign Language) and NZSL (New Zealand Sign Language). Once you and baby are underway learning new signs, take part in the app’s interactive quiz to test your knowledge of baby sign language. The Lite version of the app contains one nursery rhyme, Old MacDonald Had a Farm, with an animated video for your baby to follow and join in the signing fun. If baby likes the app, there’s a full version available (£1.99) featuring 10 nursery rhymes with animated signing videos, including Twinkle Twinkle Little Star, Wheels on the Bus and Itsy Bitsy Spider. Use this free digital scrapbooking app to record your baby’s growth, major milestones and all those beautiful memories along the way. It’s an ideal way to keep grandparents and other family members and friends up to date with baby if you live far away. With First Smile you can take and edit photos into a video, then share it privately with family and friends. The app organises photos and videos according to the age of your child, and can be synced across yours and your partner’s devices for shared access. Photos can be imported from your smartphone's photo library and from Google Photos, and you can view them on your device or, thanks to Chromecast Support, on your TV (if you have Google Chromecast). Via the app’s Photo Editor you can add personalised text to each picture, choosing from a suite of cute fonts, plus Milestone Artworks – 200+ images designed to highlight the big moments in baby’s life. If you have the time, why not try one of the beautiful filters, such as Rich Colour Pop or Black and White, to add a different feel to your baby photos?